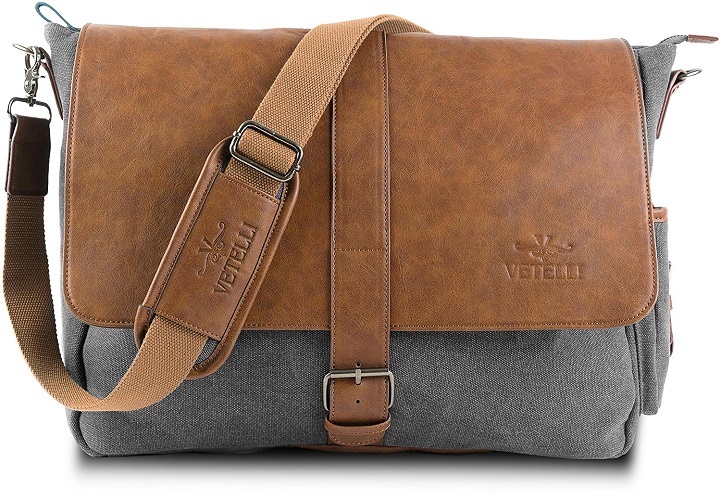 Today we will be reviewing the Vetelli laptop bag made by Vetelli! Vetelli is a relatively new company to the luggage or travel gear scene but what the lack in experience they make up for with dedication to a quality product, and it shows! Vetelli’s motto is that they focus on quality not quantity and it’s evident by the number of items on their website, it’s only about 10-12 items. Again that reason is because the focus on making their current products perfect and they almost hit the mark with this shoulder bag. To explain myself why they aren’t perfect, read on below for a more detailed explanation or see what’s good and bad at the bottom! The Vetelli shoulder bag comes in one style and that is, WOW! 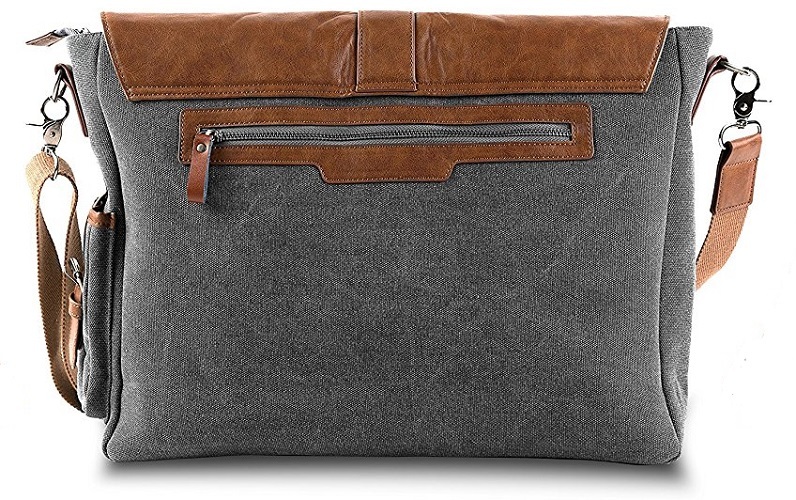 This laptop shoulder bag is one of the best looking and designed laptop bags I’ve ever come across. And it doesn’t have to be used for just laptop either. It’s versatile enough to use as a regular shoulder bag minus the laptop. I love the way Vetelli used two different but complimentary colors to pull of this impressive look. 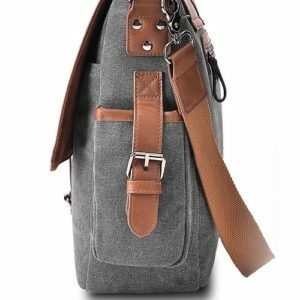 The brown over the grey is definitely in style and this shoulder bag makes you stand out from all of the other boring bags out there. Another design feature that I think makes this bag impressive is the different materials that went in to making this excellent looking laptop bag. 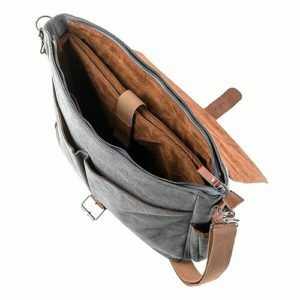 The top brown part is obviously leather, while the grey exterior of the bag is made of waxed canvas. The leather is fairly thick and you can tell it is quality leather and it’s also soft to the touch. The interior of the Vetelli laptop bag features an extremely soft felt material. Combine these three together and you’ve got a quality product that outdoes its price tag by miles. Lastly in terms of design and style, I love the fact that Vetelli uses strong grey steel for the straps buckle and the swivel clips and not something cheap or another color. They match the bag perfectly. Although the Vetelli laptop bag only comes in this one style, I think it’s perfect. They don’t try to do too much and they also don’t try and overdo it with a million different color options. They take one idea and work on it till it is perfect and you can see that is evident here. This is a great example of a product that works for both men and women. The color combination of the bag as well as the mixture of quality materials makes this a must have bag and one of my favorite pieces of gear. Vetelli prides themselves on not having a large catalog and focusing on quality not quantity and it clearly shows here. That’s why their style gets 5 out of 5 stars! I’d give them 6 out of 5 if I could. When I talk about comfortability with a piece of travel gear, I usually talk about how comfortable it is to carry it around for a day, a week, a month and how the item might have padding etcetera. However, with the Vetelli laptop bag there’s not much to go off of on comfortability but nonetheless, I will still cover it. Not only do we want a bag that looks like but we want it to be comfortable when we walk, hike or commute around. 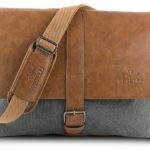 Luckily Vetelli didn’t miss the spot with this bag as they added an adjustable padded shoulder strap to their signature laptop bag here. Of course this means you can adjust it to meet your ideal comfort zone as well as having that padding on your shoulder so it doesn’t kill you. I was able to pack my 15 inch laptop and two notebooks in there with a charger and it didn’t bother me one bit while I was carrying the bag. Vetelli did a nice job of making sure the padding worked well and balance the weight evenly. Lastly, as I mentioned earlier, the leather is soft so it’s not rough on your skin or anything and feels great; as well as the felt interior. Taking these few points into account, the softness of the materials, the adjustable shoulder strap with padding, the balancing of the weight as well as being able to carry a fully loaded bag without any discomfort was very reassuring to me. 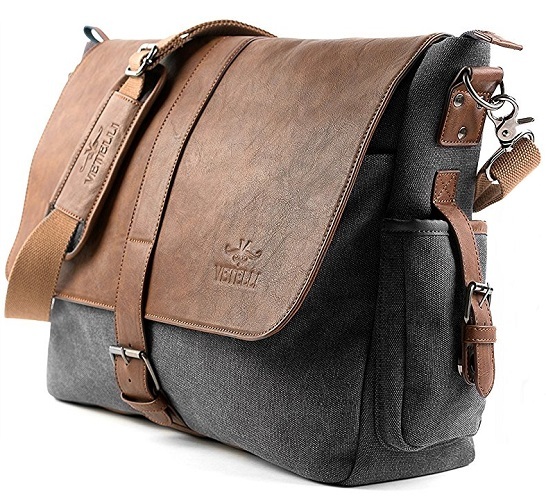 All in all this Vetelli laptop shoulder bag gets 5 out of 5 stars for comfortability! Probably the most important aspect of any product is its ability to last. You don’t want to spend your hard earned money on a product, only to see it break on you shortly after buying. Thankfully that’s not the case with Vetelli. I’ve had the honor of using the Vetelli over the past couple of months and I haven’t run into a single issue thus far. I’m not one to mince words and will call a product out if I think it’s garbage or has its weak spots but the Vetelli does not. The Vetelli laptop bag is made of premium grade materials that include PU leather, waxed canvas and strong steel zips and swivel clips. The leather has been extremely durable during my time with this shoulder bag. It has not shriveled or wrinkled in anyway nor has it scratched or scuffed since I’ve had it. I haven’t had any of those annoying loose strings either. These materials are designed to be easy to maintain and clean as well, which only helps with extending its lifetime. To top it off, Vetelli offers an exceptional guarantee. They offer a no-hassle guarantee and lifetime warranty. This is always great to see and makes me much more comfortable when it comes to purchasing an item online. It also shows how much they believe in their product and so far they have made me a believer! Vetelli is a fairly newer company but so far they act like they are one of the main players in the game and soon I could see that being the case. Vetelli’s attention to detail with regards to durability is impressive to say the least and with that lifetime warranty it’s hard to overlook what they are doing. 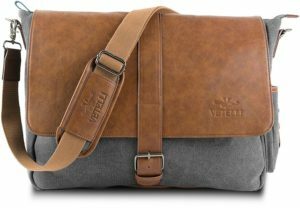 The Vetelli laptop bag gets 5 out of 5 stars for durability! The best part about purchasing any new product is exploring all of the features it has to offer. With this Vetelli laptop bag you get some pretty neat little features. For example, I was surprised to find out that this shoulder bag has 9 pockets. Yes I said 9! On the outside underneath the buckled flap there are two big pockets that I use to store small notepads and my cellphone. On the back of the laptop shoulder bag there is a metal zipper pocket that almost runs the length of the bag. There is a pocket on the side of the bag that has its own buckle and on the inside we find the other 5 pockets. There are two big pockets on the front inside of the bag, separated by 2 pen slots and the back inside of the bag has another metal zippered pocket. All of the zippers on this bag by the way have leather pulls which are a great design choice. Aside from the accessory pockets we have the main compartment of the bag that is very spacious and I absolutely love how they did this. There are two main areas to store files and papers and what not that are divided by a laptop or tablet sleeve that has tons of padding. This laptop sleeve is zip free and uses magnetic closure clips instead. This sleeve does a great job of protecting my iPad from scratches and damage as I take it with me every time I use this laptop bag. Also if you’re wondering, my 15” Dell fit inside with plenty of room to spare so I think it can hold larger laptops as well. It also is able to expand in case you have a thick laptop. Another great feature about the Vetelli laptop bag that I love is that under the buckled flap, they have another metal zipper with leather pull that you can use to close your bag in case you were worried about your contents falling out. Lastly for the good things, the bag also is rigid enough to stand up on its own when it has nothing in the laptop bag; it does not get floppy and fold over like other low quality bags. This does a great job of holding its shape. The one and ONLY thing I could find wrong with this shoulder bag is such a simple thing they could have added that I’m frankly shocked Vetelli missed it. This bag does not come with a handle. You only have the padded shoulder strap to use. I know to some that’s not a big deal but to others it’s worth returning the bag over. I don’t really mind one way or the other if this is a laptop bag with a handle but it would have made it a little more convenient. The Vetelli bag gets 4 out of 5 stars for functionality. All in all this was a fun little laptop shoulder bag to review and I thoroughly enjoyed using the product. It caught me by surprise in both many good ways but also a single bad way. But to recap, let’s take a look at how this bag faired. The bag has fantastic style. It only comes in one design but that’s all it needs. The mixture of the PU leather and canvas is a winning combination. The comfortability was splendid as I loaded up this bag and used it daily and for long periods without it giving me any hassle or pain whatsoever. The padded strap was perfect. The durability of the Vetelli laptop bag is incredible. I used this bag every day for a couple months with no signs of wear and tear and the fact that they offer a lifetime warranty only makes this bag’s price tag even juicier. The functionality is impressive for the size of this shoulder bag. It has 9 pockets and 3 separate main compartments in the spacious interior. Lastly the price is extremely appealing. You could buy 3 or 4 of these bags for what you’d pay for a similar name brand bag. Vetelli dropped the ball by not adding a handle to the top of the bag so you don’t have to use only the shoulder strap to carry it around. Between all of the good things about this bag and the one improvement that could be made, overall, this bag is a winner. It doesn’t hurt that for this quality of shoulder bag, the price is extremely appealing. Overall the Vetelli laptop shoulder bag gets 4.5 out of 5 stars and a buy recommendation from me. If you have this bag and want to leave a review or a comment, you can do so below!